GAWP’s Spring Conference and Expo | Chemtrac, Inc. The Georgia Association of Water Professionals 2014 Spring Conference & Expo is scheduled for April 15 & 16, in Columbus, GA. Mark Vandiver, Chemtrac’s Manager of Market Development, will make a 30-minute presentation, Optimizing Coagulant Dosage Laboratory Charge Measurement, and discuss a simple alternative to jar tests. He will demonstrate how the CCA3100 Coagulant Charge Analyzer will allow an operator to determine target coagulant doses in less than five minutes, saving significant time compared to traditional jar testing. He will also report how the CCA provides continuity in results between operators by removing the subjective interpretation of jar testing. 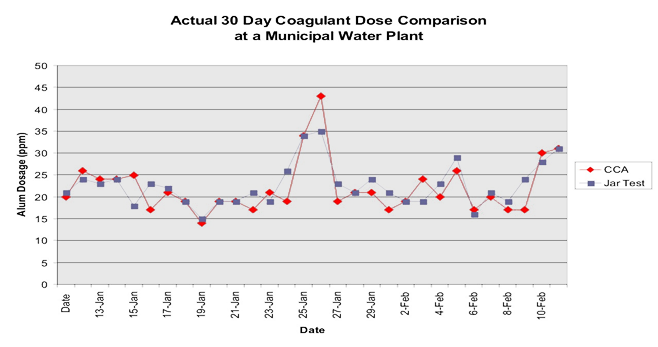 The following data demonstrates the CCA’s performance compared to routine jar tests. Mark’s presentation will include success stories, plant data, and future upgrades planned for Chemtrac’s Coagulant Change Analyzer.